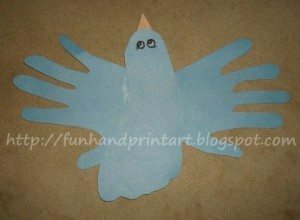 This handprint and footprint bluebird was super easy to make! Trace around both of your child’s hands & one foot. Glue the hands to the back of the foot to create wings making sure that the heel of the foot is in the head position. Draw on eyes and add a beak. Your kids are sure to have fun flying this adorable bird around the house!